I first began exploring the Goldfield Mountains in 2008. I posted several blog entries from those early exploratory rides. 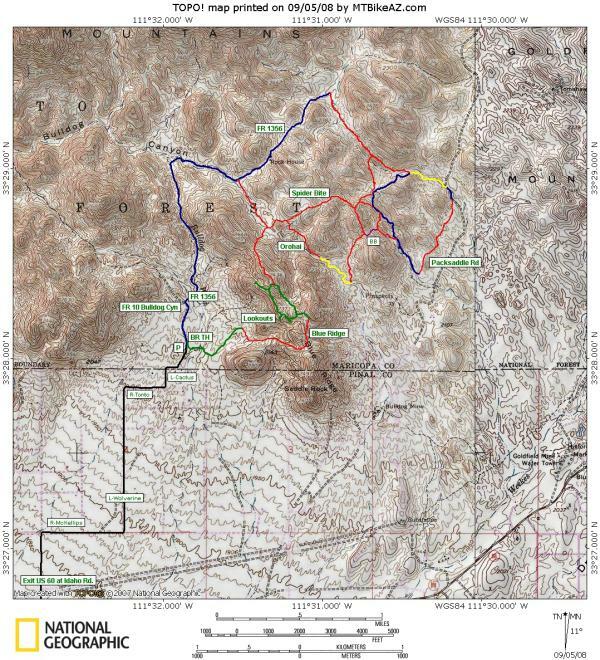 I had a handheld GPS, Google Earth, and chatter from the MTBR Arizona forum fueling my interest in this rugged, mysterious, wilderness, know to few mountain bikers. Ten years later the place remains rugged, untamed, and is still known to only a few who dare to venture into the unforgiving country. There’s plenty of Golden singletrack to be found, you’ve just got to work for it. I made the map below so long ago, these trails are still there, a bit more ridden in than a decade ago, and thanks to Trailforks and some awesome contributors, you can find the good stuff quicker, but not any easier. Good luck. I’ve had a few requests from local riders for this map. It’s about time I posted something about the Goldfields. This map will at least get you started. My favorite route starts at the TH where FS 10 starts. Indicated with a P on the map below. Just past the gate is the Blue Ridge Trailhead. If you like climbing start here. The doubletrack leads you to an umarked junction where unmaintained singletrack begins. Climb up to the lookouts and play around soaking up the Blue Ridge views. Take the singletrack to the 1356 and ride the Jeep road to the unmarked singletrack up north. From there you can do what you will. There’s plenty of smooth and plenty of tech to keep the adventurous grinning. If you want my GPS tracks, shoot me an email. Mike I just rode (or tried) blue ridge…spectacular views. Hike-a-bike ascent. Did small loop but I single speed. Can you suggest a route that on Northern single track that makes this area more practical? Tom, I have the mileage for each of the trails in a gpx file. Not readily available. They are fairly short though. The topo above shows how long one mile is, that should give you an idea. Hi…dumb question. New to valley. Does any have mileage for these trails/single track? I am going hiking there tomorrow. I’d love the gps tracks!